It's been awhile since I started using the Hegen bottles, in conjunction with another bottle (it can interchange teats and straws; let's call it Bottle A) I got for Hansel, the Hegen used for milk and the Bottle A for water or juices. If you have read my introductory post on Hegen, you should know that it is designed in a way to ease breastfeeding mommies' troubles when transferring expressed milk from a storage bottle to a feeding bottle. Hegen is a 2-in-1 storage AND feeding bottle, so parents save the trouble of transferring, plus not wasting even a single drop of liquid gold due to the transfer (parents who feed expressed breast milk to their babies will understand this pain, especially the mom who painfully expressed it haha). If you haven't read, now you know! 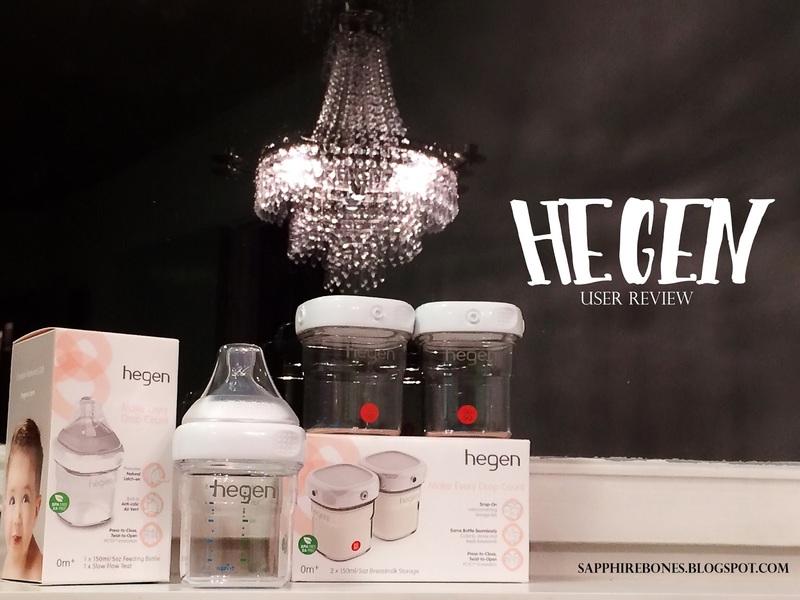 What I have found out after using the Hegen myself is that, it is designed in a way that would make formula feeding easier as well!... I will use Bottle A (which is the typical round bottle design all the milk bottles in the market have) as a comparison. Pouring the formula from the scoop into the Hegen bottle. Pouring the formula into Bottle A. What can you tell from the pictures above? With a wider opening, it reduces the chance of spilling the formula. Yay to evitable cleaning up while rushing to prepare milk for a fussing baby! How much do you spend on bottle brushes to wash baby bottles? I'm not sure about you but I had to buy one every 1-2 months and it costs $9.90 per brush! So annoying that on top of so many costs of raising a child, you still have to spend $9.90 almost every month on a cleaning brush. But you have to, because there are many hard to reach nooks and crannies in a typical bottle, and the last thing you'd want is for bacteria to grow in your babies' bottles. I can use a cheap normal sponge (without the metal scourings) and reach to clean every part of the Hegen bottle thoroughly! I have to try and 'stretch' my fingers to try and go as far in as possible to clean the bottom of the bottle. It always felt like my fingers are breaking and I still couldn't reach the bottom. I would feel it's not really clean even after washing, unless I use a bottle brush. How much does a normal dish washing sponge cost? Close to nothing, I believe. Besides, bottle brushes can actually also cause scratches to the bottle, which becomes breeding grounds for germs and bacteria. May I also add that it is heat safe and dishwasher safe? For times when you're feeling lazy (I strongly believe that most items would last longer with handwashing), just pop it in to the dishwasher! One negative point for Hegen would be the opening of the bottle, as it can be quite difficult to twist open the lid, especially when your hands are wet. My family helper always had difficulty opening it whenever she has to wash it and have to ask me to do it. But, it can also be a plus point to other parents as that means it's really tight = no spillage. I would really love for Hegen to come up with a bottle with interchangeable teats/straws or glass Hegen bottles! If that happens, I will throw all my other bottles away haha! Hegen is available to purchase, exclusively at Motherswork! It is also available at Motherswork stores island-wide.